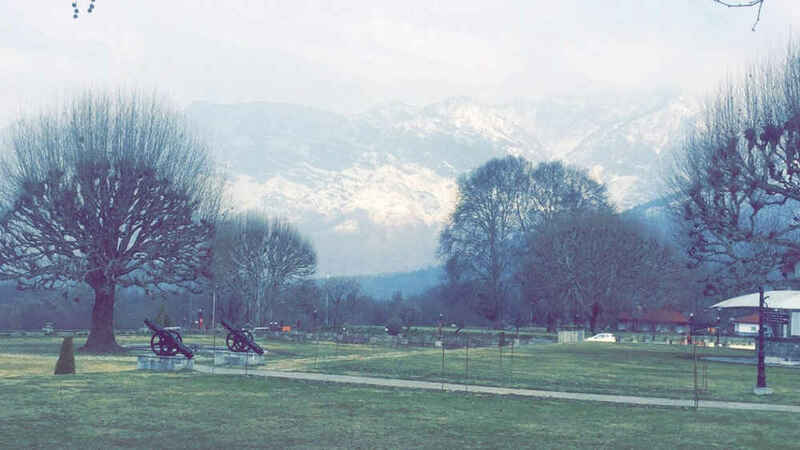 Kashmir in summers vs Kashmir in winters; an incessant wrangle right from the time of planning the trip to our animated chats with the locals and on leaving, we came to the conclusion that experiencing Kashmir in all seasons is a MUST *marking winters off our checklist*! 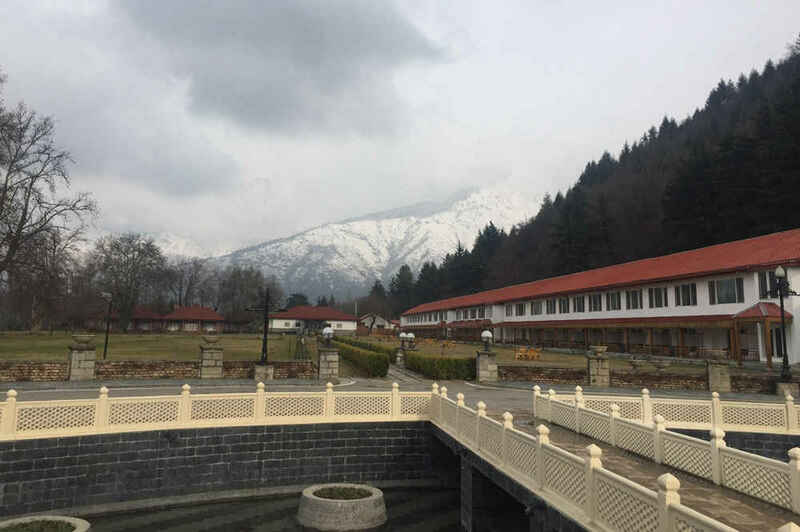 Escaping the non-existent winters of Delhi, we decided to head to what is touted as ‘heaven on earth’ as a short getaway in the month of February and being first-timers Srinagar was the obvious choice as was The Lalit Grand Palace hotel. Encircled by the Himalayan Ranges and overlooking the picturesque Dal Lake (a mesmerising view which we would wake up to every morning!) The Lalit Grand Palace is a destination worth visiting in itself and that more or less sums up our stay here! 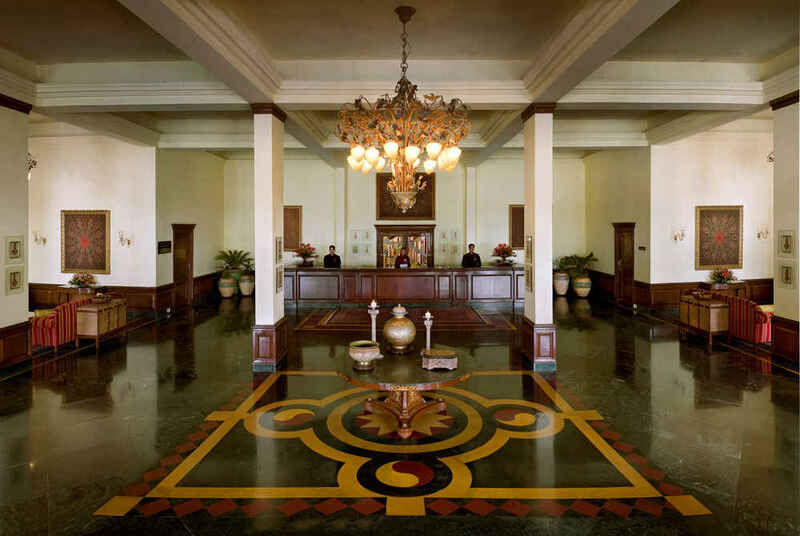 This is one hotel where you can quite easily transport yourselves from the contemporary to the bygone era if staying in their old wing however that’s not to say every corridor and every corner of the hotel has its own story to tell. Once home to the Maharajas and called upon as GulabBhawan, the palace was built in 1910 by Maharaja Pratap Singh. Later on his nephew, Maharaja Hari Singh, with the help of local artisans decorated and embellished the palace using the best of furniture, upholstery, carpets, and handicrafts and moved to Mumbai which was when it was converted into a hotel. Featuring 113 palace rooms & suites including 10 luxurious cottages, you’ll definitely feel spoilt for choice! We stayed in one of their Super Deluxe Rooms which was spacious with tastefully done interiors and opened up to sprawling gardens which we were told has over 1000 varieties of trees and flowers of every kind blooming during spring/summers! 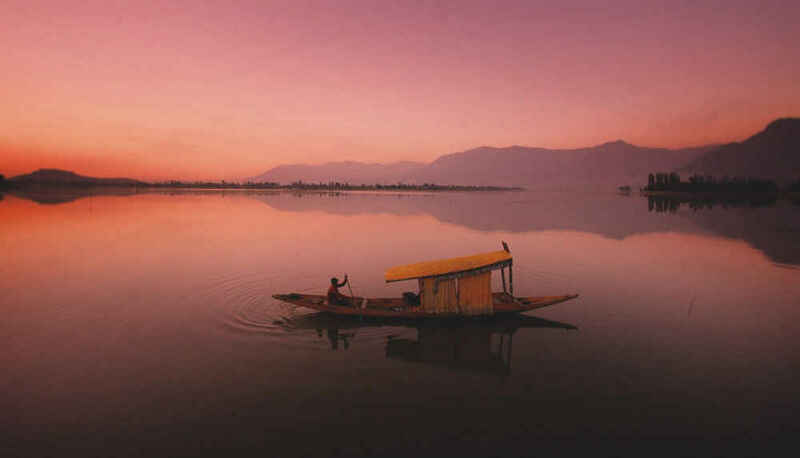 Our imaginations running wild, we made peace with the picturesque views of the Dal Lake. We were warmly welcomed with Kashmir’s local traditional green tea special called Kahwa with saffron strands, honey and almonds; a soothing brew we could sip on all day long! This was enjoyed with the unusual Kahwa Cake, a unique combination of almond powder, green tea powder, dry fruits and saffron! Curious to see what all the hotel had to offer first, we decided to take a tour of their old wing! 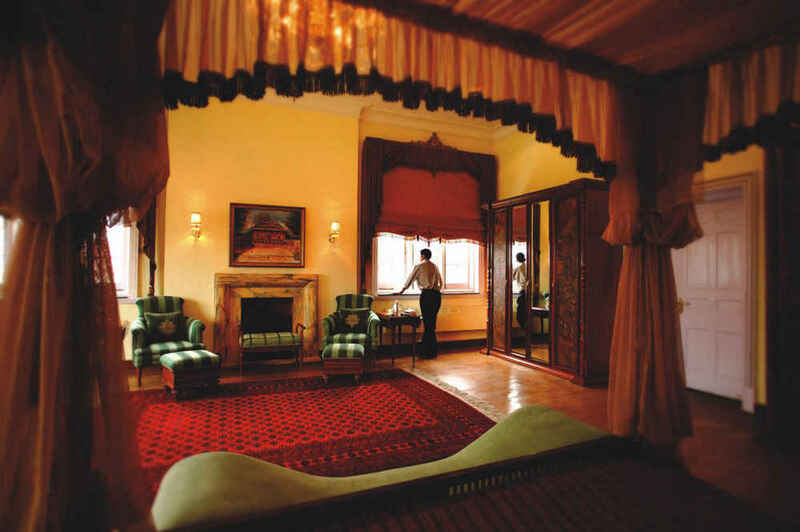 The Maharaja Suite is pure luxury reserved best for royalty, replete with antique furniture, rich artefacts, silk Kashmiri carpets and handicrafts, a personal library, butler service, a living room with 2 large bedrooms and the works basically! The Maharani Suite follows with a four-poster bed, a dining area, living room with couches, sofas and writing desk, guest powder room and a plush bathroom! Both suites overlook the Dal Lake and sprawling gardens through its large windows and you can’t help but wonder what it’d be like waking up to such views everyday. 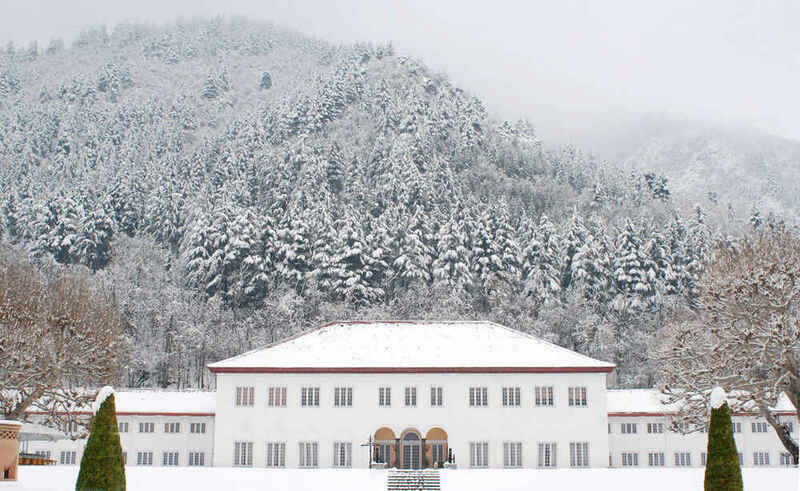 The hotel has four restaurants & bar (some of which are operational only during the summers), grand banquet & conference facilities, the AUM boutique housing the treasures of Kashmir, a delicious in-house bakery, Rejuve-The Spa along with a salon, gymnasium, health club and an all weather swimming pool. What we loved the most was the underground cellar which opened up to a cosy and chic bar, a place to host private parties and it even had a secret tunnel; we swore to be back here with a group of friends, to enjoy this particular hideout! After thoroughly enjoying this museum of a property, so rich in history, we had built up quite an appetite and headed to The Dal Bar where we enjoyed a few Mojitos which were very refreshing and tucked into delicious Chinese food, all prepared by the skilled chef, Digvijay who was kind enough to take care of our every whim and fancy. The highlights of our meal was their juicy Chicken Dimsums which we happily gobbled up in no time, The Crispy Corn Salt n Pepper presented beautifully and tasted just as good with a perfect balance of sweet and sour. This was followed by a Lotus Stem preparation which was crunchy and packed quite a punch for all spice lovers. For mains we had Shredded Chicken in Schezwan Sauce, Crispy Black Pepper Lamb and Egg Wrapped Fried Rice followed by a delicious dessert called Brandy Schnapps with Hazelnut which was superb! The next morning we headed to the grand Darbar Hall for a hearty breakfast. Rather than the food, you can’t help but take in all the beautiful surroundings, from the portraits of the Maharajas to the huge carpets that have been walked upon for the past 300 years! 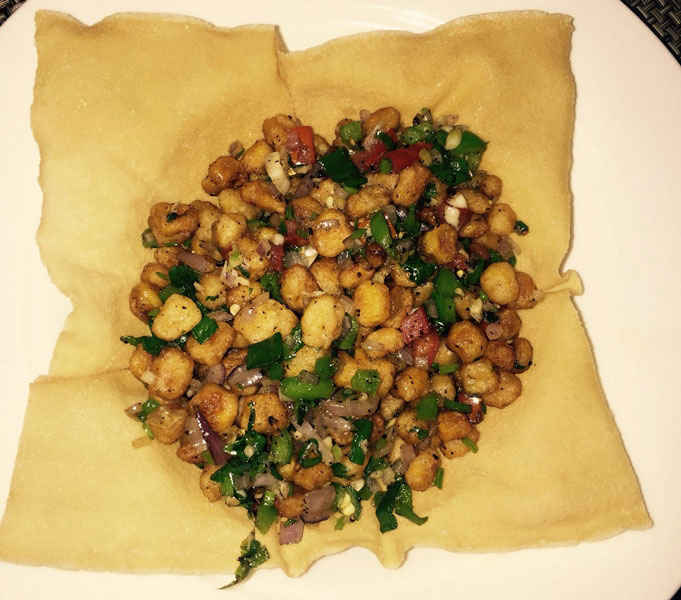 Besides the muselis and juices, we always make it a point to relish a Dosa when at any Lalit property and the one had here in Srinagar did not disappoint. 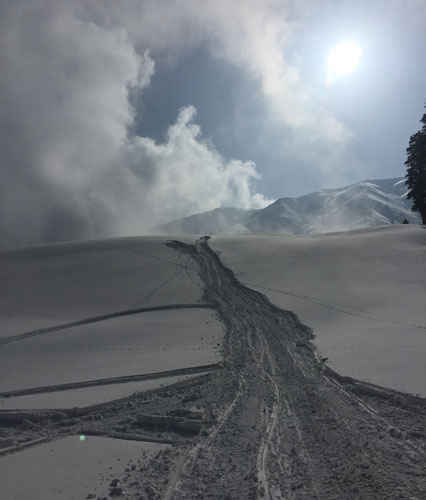 We then decided to make the most of the day and headed out for an excursion to Gulmarg with our trusted driver, Lateef who has been with the Lalit for many years. When at the Lalit, you must request for his presence as we found him to be most amiable and considerate. Right from our hotel pick up to the drop off, he regaled us with stories of the locals, their cultures, the floods and showed us how it&apos;s changed the landscape of Srinagar and patiently entertained the 1000s of questions we had as tourists and never once did we wince at his driving skills! He made it a point to reiterate how friendly everyone is in Srinagar and there is never a reason to be scared of going anywhere or interacting with anyone! Approximately 60 kms, 1.5 hrs and many cups of kahwas later, we reached our destination! We got off a point whereby we were given a set of gum boots and jackets, with tons of instructions asking us to be careful of the slippery ice and a local guide who would take us up Khilanmarg, a small valley and the site known for skiing around the globe! The winding roads leading to the valley was surely a sight to behold with towering Deodar trees doused with snow and the biting air. 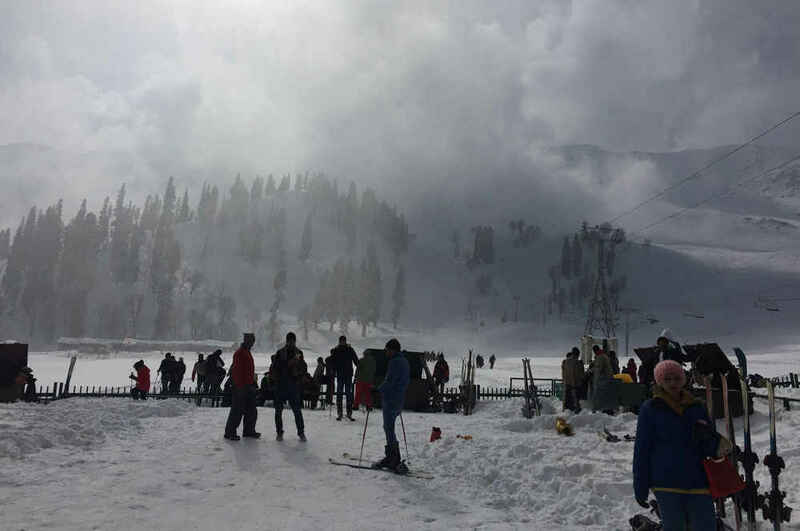 As soon as we reached atop, we found all kinds of people coming up to us selling some service or goods; from sledges, snowmobiles and skiing to locals screeching “chai, kahwas and coffees” on top of their lungs, there’s plenty to keep you occupied here! Thanks to our local guide, who managed to get past all the tourist traps and headed onto the famed Gulmarg Gondola, the only cable car system in Asia which travels up to 13,500 feet! An exhilarating and somewhat unnerving ride *don’t be surprised if you’re left hanging in mid-air due to some temporary electrical interruptions* the ride is worth the while though once you step down to either phase 1, 2 or 3 (3 being the highest peak). We got off on Phase 2, 15 minutes later as advised by our local guide because that’s where all the action was. Every second person was either a skilled skier or learning the ropes in a small chalked out area here! We took in the grandeur and found it to be quite hot up here. After briefly taking in the beauty, we were interrupted by different vendors offering different activities and we zeroed in on the snowmobiles priced at different phases - K1 to K4! Pro tip - Bargain and bargain hard for K1 may be not as different as K4 though they pitch it as polar opposites, nevertheless we loved the thrilling ride as we climbed and toppled down the undulating peaks with snow softer than salt and a complimentary fall in 4 feet of snow! We then reluctantly headed back to the hotel. For the much-awaited dinner at the hotel, we were treated to the soulful and spectacular authentic Kashmiri food in the form of a Wazwan. A truly elaborate preparation, this complex 36-course cuisine is generally prepared overnight because of its massive scale and is predominantly non-vegetarian, enjoyed together in groups of 4. We were treated to a mini version of this with about 8-9 courses *phew*!! Our chef, accompanied by the wazi, Farooq Ahmed Khan prepared a stupendous meal for us! We started out with the traditional hand-washing ceremony called Tash-t-naer, followed by the wazi coming out every now and then and serving us each course in huge earthen pots. Their Akhrot (Walnut) ki Chutney deserve a special mention; it was creamy, perfectly blended, healthy and unlike anything we’ve tried before! Onto the food then, the Maithi Maas was a concoction of meat and fenugreek, a blend made in heaven with flavours seeping right through the meat! The Rista & Kebabs were juicy, Rogan Josh - spicy as it should be, Tabak Maaz (lamb ribs) was one of our favourites being soft with a crunchy exterior, tons of flavour and prepared in ghee. The Aloo Gosht Bukharas, mutton made in a plum gravy stole the show and how they balanced the sour flavours was beyond us! 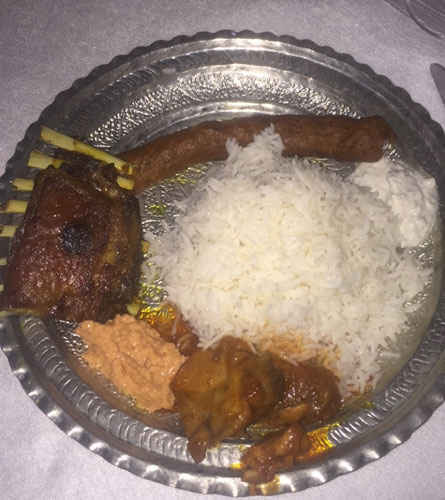 After another round of Gushtabas, Yaknis & Phirnis… this feast of a meal came to an end! We must add that a lot of people told us about visiting Ahdoos for an authentic Wazwan as opposed to the hotel, but having tried and compared both, we can safely say that the hotel did an excellent job and Ahdoos, although great in its own right, did not live upto the hype. During the 1 hour ride, we bear witness to other Shikaras coming and selling their wares on water, mini delicious smelling Shikaras selling kebabs which they prepared and served to us on the spot (the Boti Kebab was fab) and the floating market. 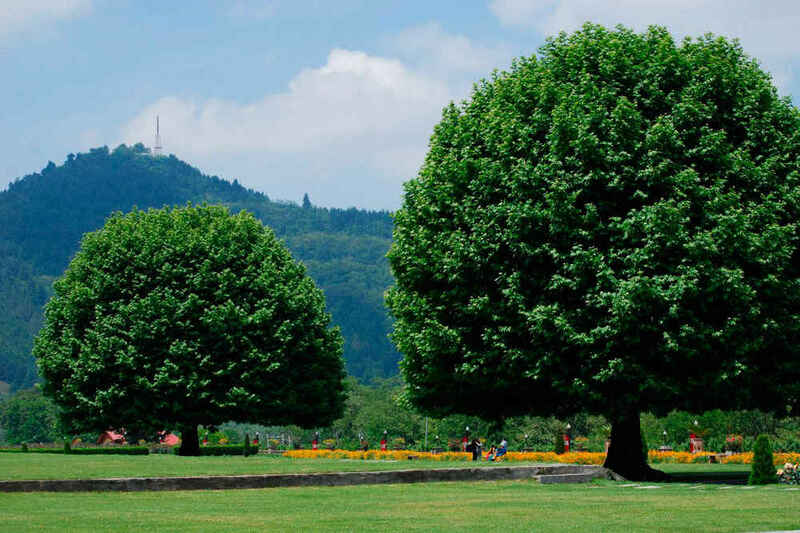 We then went on to visit Pari Mahal which is a seven terraced garden located at the top of Zabarwan mountain range overlooking the city of Srinagar and offering envious views of the city. This is a great place for photo-ops with many people found clicking selfies or simply unwinding! Back to the hotel, and being Valentine&apos;s Day we were treated to an amazing private barbeque in our backyard with a bonfire serenading us with music, a beautifully decorated table, and a chef preparing live food in front of us. Out of everything we loved the Stuffed Chicken with Dry Fruits which was quite a unique and rich preparation for a barbeque. 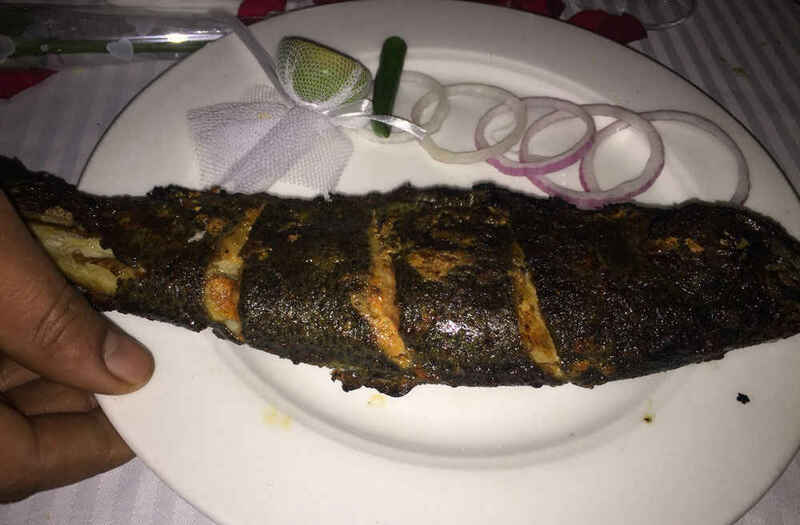 The fish was charred perfectly and high on flavours, the freshly prepared Paneer Tikka was absolutely melting, the Ajwaini Malai Tikka was one of our favourites amongst the starters, the Bharwan Aloo was similar to the stuffed Chicken with a crispy outer layer, the Boti Kebabs were most succulent! This was followed by Lalits famous and most divine, Dal Bukhara cooked overnight, flavourful Chicken Biryani and Raita. The special Phirni and Strawberry dessert was also quite refreshing. We came to know that Lalit has an organic vegetable garden where they grow everything from cucumbers, strawberries, plums, apples, cherries, to lettuce, bottle gourd, cherry tomatoes, mint, maize, artichoke and various other vegetables and fruits! The next morning, we made our way back to Delhi with a promise! Come summers, we resolved to be back to witness the Chinar trees in bloom, the lush gardens, the shining sun reflecting off the Dal lake, the locals rid of their woollen pherans and traditional heater kangris and of course, back to witness the heart-warming hospitality of the people and of the Lalit, the definite cherry on the cake.